IU South Bend’s impressive array of public art is no coincidence. It began with Chancellor Emeritus Lester Wolfson’s vision to build a campus rich in the arts as well as the humanities. Looking for a strong community leader in the arts, he hired Howard Zisla, who was the director of the South Bend Arts Center at the time, to chair the Department of Fine Arts. In turn, Zisla hired sculptor Tuck (Harold) Langland to build the sculpture program at IU South Bend. Zisla and Langland shared an inspiration to make IU South Bend one of the best figurative art departments in the area at a time when conceptual art was the trend. The fine arts department was small with only a few full-time faculty, so Langland hired visiting professors from around the world to expand and teach new techniques, exposing students to a variety of methods and cultures. Moreover, Langland became a well-known figure sculptor in his own right, showcasing his installations and winning awards around the world. 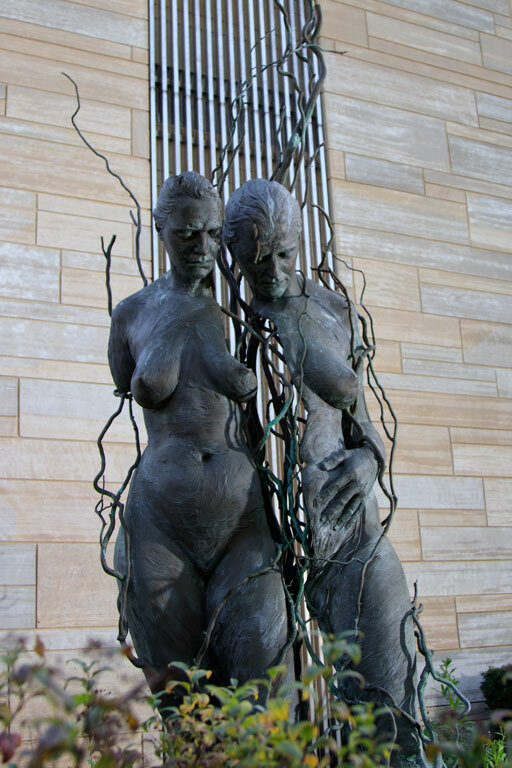 During his 30- year tenure at IU South Bend, Langland succeeded in building IU South Bend’s reputation for figurative art and added significantly to its collection of public art. Today, the campus boasts eight pieces sculpted by Langland. Recently, IU South Bend acquired another beautiful sculpture. 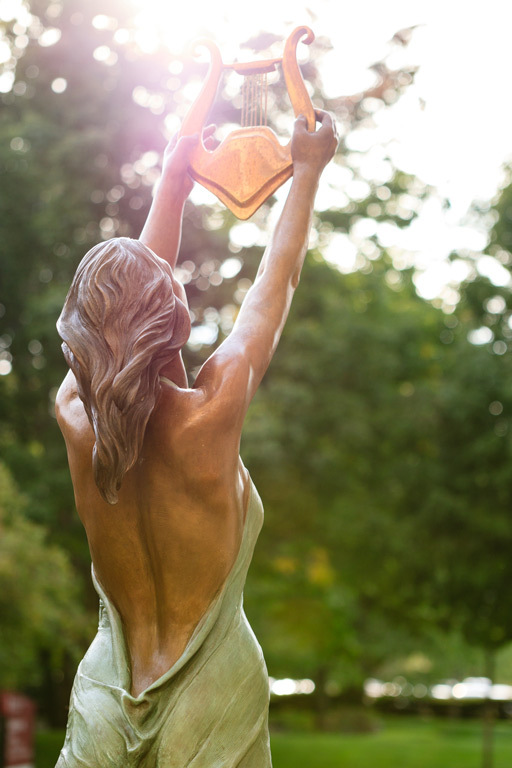 Euterpe’s Gift was created by IU South Bend Associate Professor of Fine Arts Dora Natella. Euterpe’s Gift graces the approach to the Louise E. Addicott and the Yatish J. Joshi Perfomance Hall outside Northside Hall. Euterpe, one of Zeus’ nine daughters, was the goddess of music, song, and dance in Greek mythology. Born in Venezuela to an Italian family and raised in Italy, Natella studied figurative art at the Academy of Fine Arts in Naples, and earned her MFA in sculpture at Western Michigan University. 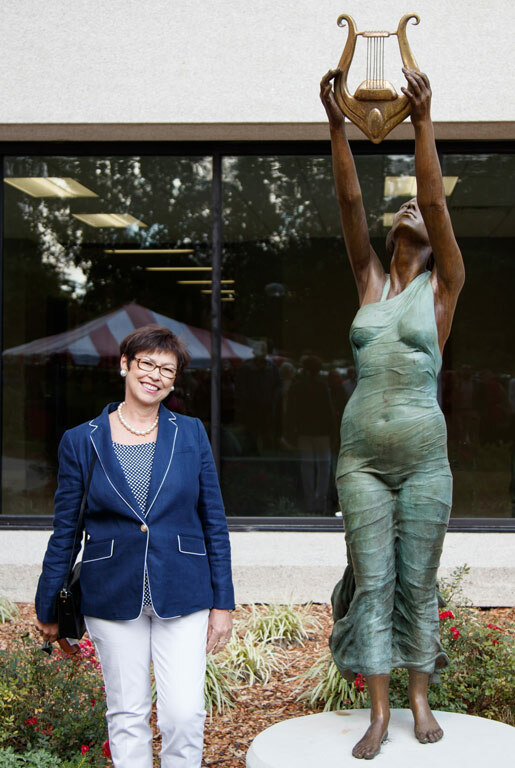 Arriving at IU South Bend in 2004 to lead the sculpture department after Langland retired, Natella continued to build on Langland’s vision of figurative art, but also encouraged students to find their own paths. “I’ve expanded the program beyond just one direction,” said Natella. “I wanted students to be aware of many directions in sculpture, to get excited about manipulating different materials.” Taking advantage of the wealth of local artists in the area, Natella invites them to visit her classes and share their craft with students. “I want them to see what’s being done and has been done and find their bliss,” she explained. Natella’s other large sculpture on campus is called Gaia which is on display at the north side of Northside Hall near the pedestrian bridge. Like Euterpe’s Gift, Gaia depicts a woman in Greek mythology, the goddess of Earth. Through her work the artist engages viewers with the spirituality of women—motherhood, death and mourning, celebration and renewal. “I could not express myself without my gender,” said Natella. She actively exhibits her sculptures locally, nationally, and internationally in outdoor venues, museums, and private collections and much to her delight, she also has a growing number of commissioned pieces on public display. An elected member of the National Sculpture Society for many years, Natella became a fellow in 2016. In 1988 after the loss of a well-respected retired dean, a beloved staff member, and a student, the IU South Bend Student Organization asked Tuck Langland to create a memorial in their memory. The nine-foot bronze sculpture, Memory: Though They are Gone, Their Impressions Remain, is located on the campus mall. 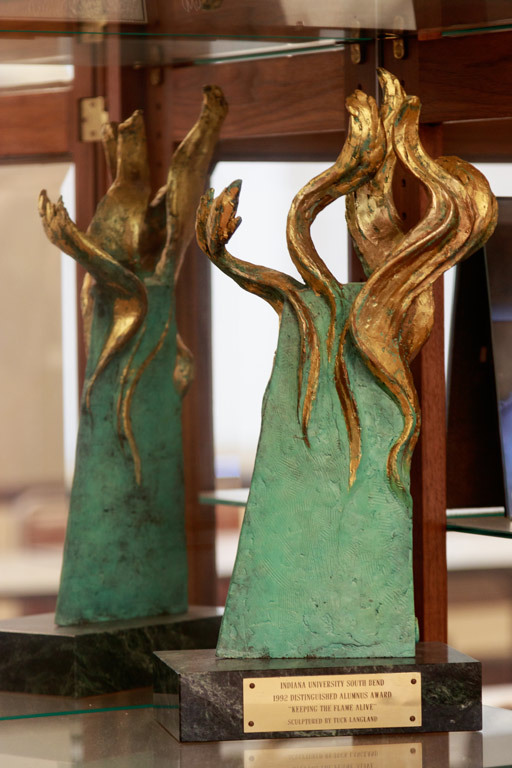 Tuck Langland created Keeping the Flame Alive, a semi-abstract sculpture depicting bronze flames with gilded gold leaf edges, which served as an annual award given to outstanding alumni by the IU South Bend Alumni Association. A cast stands in the Alumni Room in the Administration Building. 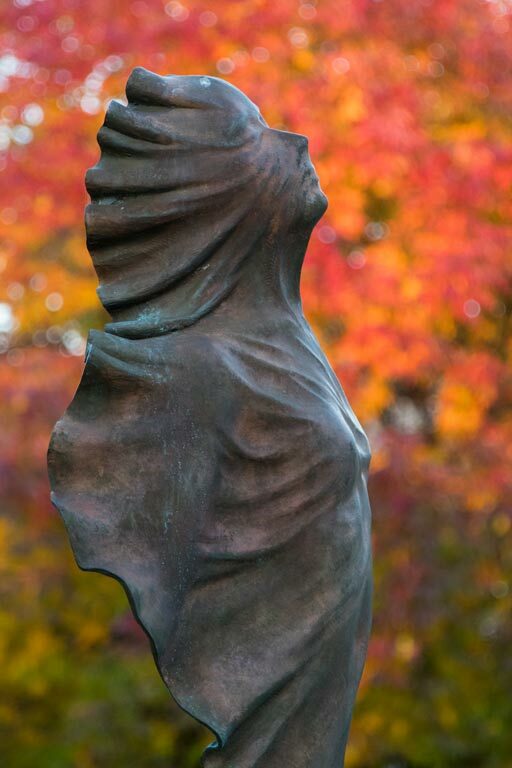 On exhibit outside Northside Hall, Gaia is an 11-foot bronze sculpture created by Associate Professor of Fine Arts Dora Natella. The bronze sculpture is a massive rendering of a split woman figure with a deep gash down one of the two faces. It is a tribute to Greek mythology’s Earth mother goddess Gaia, and a symbol of the current fragile state of the planet. 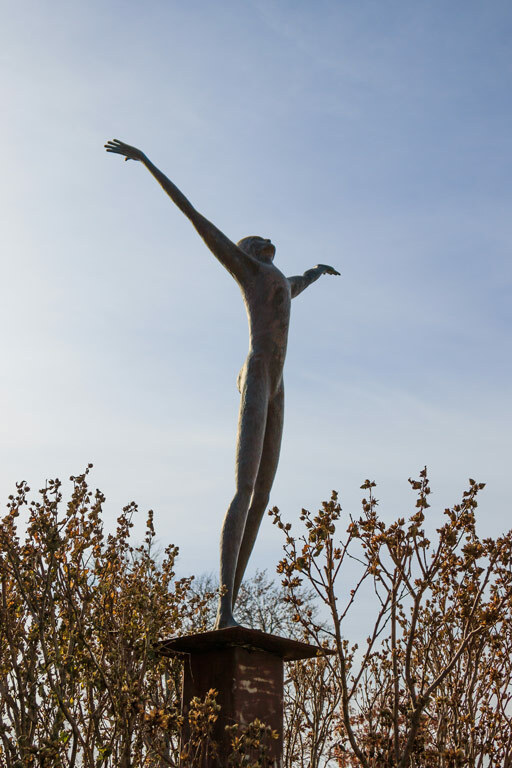 Jon Pontius designed and cast Freedom, an eight-foot bronze sculpture located on the west lawn of the Administration Building, while he was a student at IU South Bend. 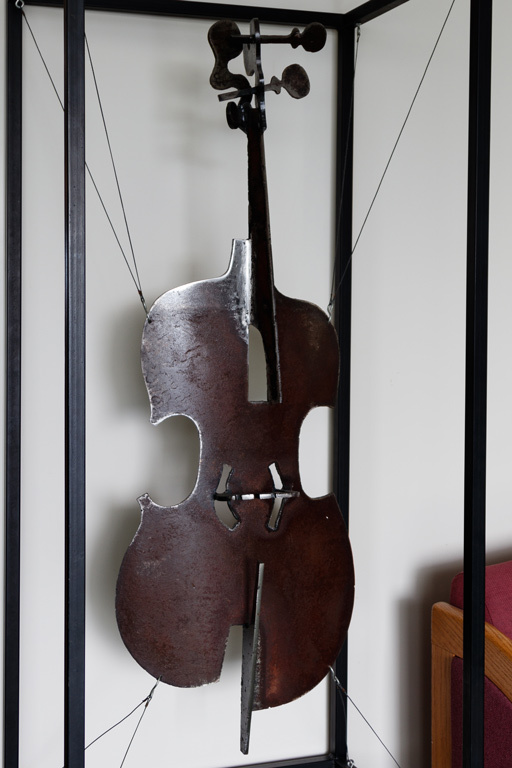 Unplayed Cello, located on the 4th floor of Schurz Library, is a six-foot welded steel sculpture created by Tuck Langland. The Class of 1977 purchased the artwork as a graduation gift to the campus. 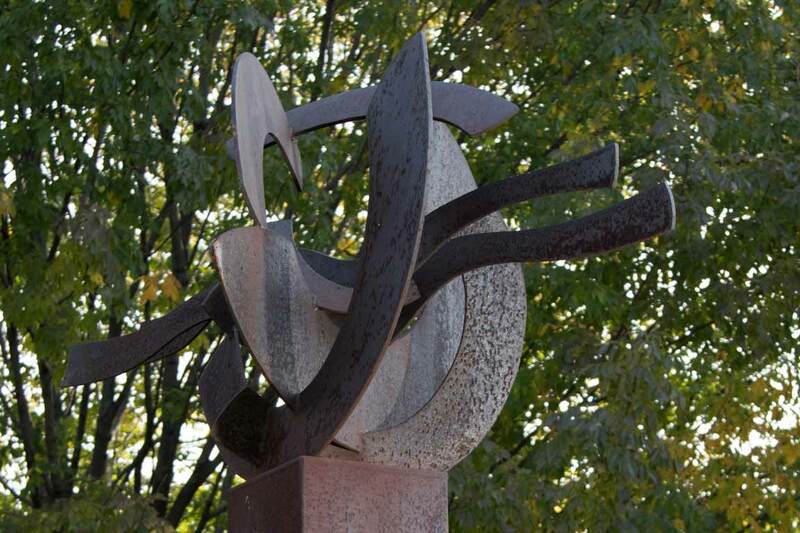 Ring Ribbons, commissioned by the Class of 1973 and located outside Northside Hall, is the first sculpture created by Tuck Langland for the IU South Bend campus. Made of corten steel, the 11-foot sculpture’s wavy line parallel to the ground represent the St. Joseph River, and the curving lines are the campus and community that grew up around the river. 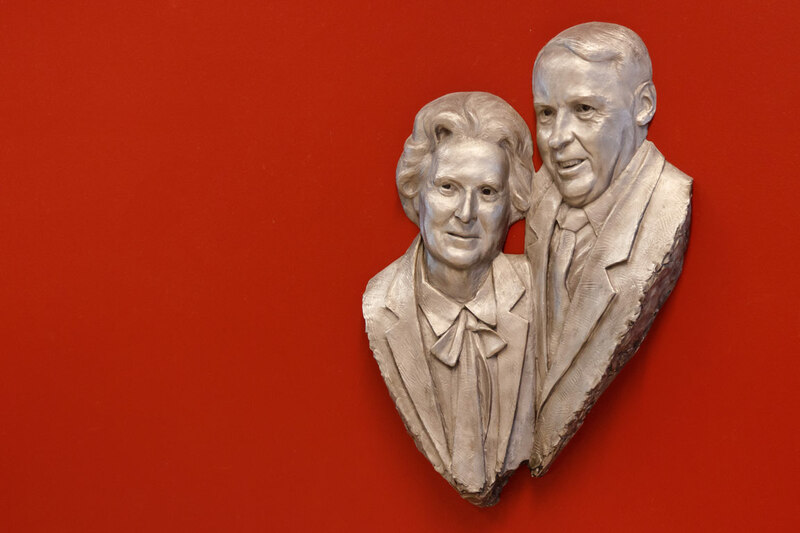 Dorothy and Darwin Wiekamp, a stainless steel portrait hanging in Wiekamp Hall, was created by Tuck Langland to honor the couple’s generous gift toward the furnishings of the new classroom building.